Due to the unique action of the Vredo seed application, the grass seed is placed in direct contact with the soil, giving almost total seed germination. The discs give seed spacing, meaning that one-pass operation will generally suffice with no disruption to play even on fine turf. 4 models of the Compact Series are available, each as a 3-point linkage mounted option or towed with it’s own hydraulic lift frame. The simplicity of het Compact Series enables it to be used in many areas and its working width of 1 m to 2.2 m makes it effective in any situation. 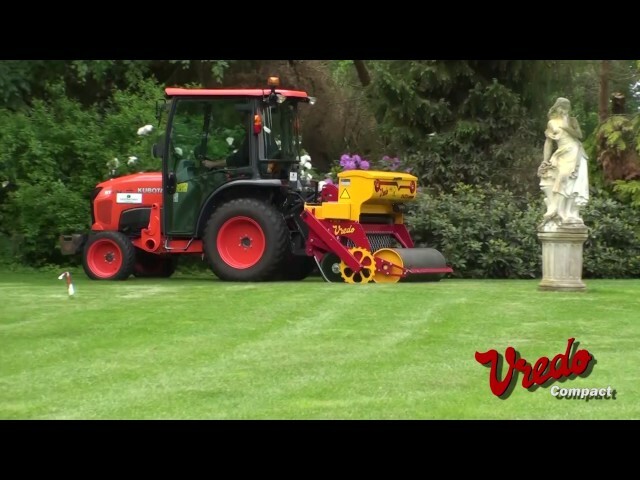 Camp sites, horse racing circuits, local authorities, contractors, golf courses, sports facilities and private and country estates all make extensive use of this machine. This all-rounders has an inter-row distance of 7.5 cm and is made for hard ground conditions. The fields on which these machines are used, often have to remain in use. A camp site, for example, cannot be closed off after preparation of the grass. Using the Vredo means that grassed areas can remain in use and can also be mowed as the grass seed is perfectly confined in the narrow slit.